Cooking vegetables in different ways is important, least of all to ward off taste fatigue - sometimes we eat them raw (eg salad), sometimes steamed (drowned in butter or coconut oil), sometimes stir fried and sometimes roasted. And tonight they were baked in broth- a bit like a casserole or braise, though uncovered. I used to cook vegetables in this way a lot but haven't for many months. My friend Caitlin yesterday shared with me her kipler potato in chicken broth recipe and I simply added a few more root veggies. Thanks for the reminder and inspiration Caitlin! 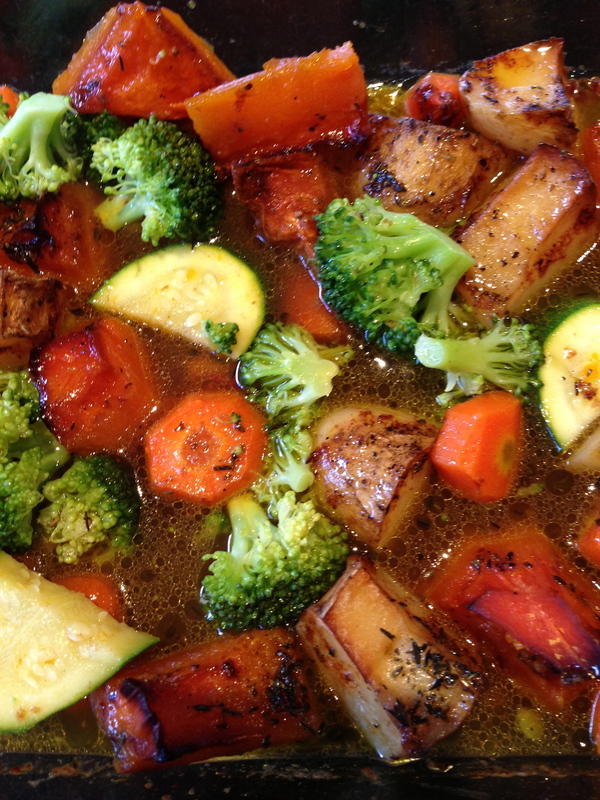 The vegetables absorb much of the broth making them melt-in-your-mouth delicious. A great way for infants to enjoy their first veggies, with the broth adding much nutrient-density and aiding digestion. Place vegetables into an oven proof dish (e.g. large Pyrex container). Add enough stock to half cover the vegetables. Add dollops of butter over the vegetables. Season with salt, pepper and a scattering of thyme leaves. Cook uncovered at 120 degrees for a couple of hours until veggies are soft and cooked through. Cover with alfoil until ready to eat. I steamed some green veggies (eg broccolli and zucchini) and threw these into the root vegetable dish at the very end before serving. Serve as a side to a main meal. For meat-based casserole recipes refer to my earlier blogs here, here and here. So if you are looking for a different way to enjoy your veggies, try this out and let me know what you think. Kali Orexi! Free giveaway! Please help me name one of my favourite products!